The Beechcraft Premier is the name given to a series of light jet aircraft made by the Beechcraft division of Hawker Beechcraft. The series consists of the Model 390 Premier I and the Premier II. The aircraft was designed to compete with the Cessna CitationJet series of aircraft. Design of the Premier I began early in 1994 under the designation PD-374 (PD for Preliminary Design), and development was authorized to continue early the following year. 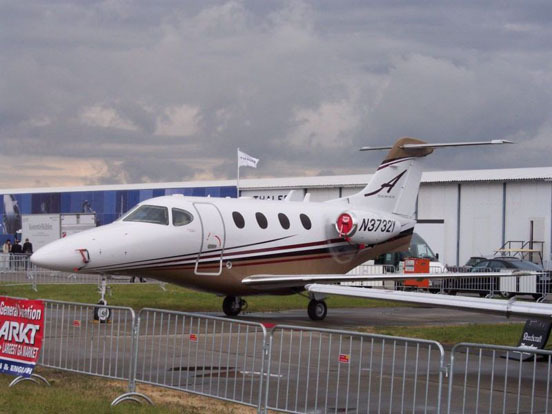 The aircraft was officially launched at the annual National Business Aviation Association Convention in September 1995 and construction of the first prototype commenced late in 1996. The Premier I prototype was "rolled out" on 19 August 1998 and its first flight was on 22 December 1998; four prototypes were used in the flight test program and its FAA Type Certificate was issued on 23 March 2001. On 22 September 2005, the upgraded Premier IA was certified. Astronaut Robert "Hoot" Gibson with the Premier IA on 10 May 2009 set a new speed record for the 1,000km (545nm) trip from Hawker Beechcraft's international headquarters in Chester in the UK to Geneva in 1h 13min 30s, representing an average speed of 445kt (823.8km/h). Gibson, at the controls, was accompanied by aircraft owner Robert Kay and Hawker Beechcraft pilot Aaron Comber. The company has submitted the data to the National Aeronautic Association for verification. On 19 May 2008 Hawker Beechcraft announced the launch of the Premier II. Developed from the Premier IA, the new aircraft will feature higher cruise speeds, a 20% longer range with four passenger, and increased payload. The aircraft will continue to feature composite materials for the fuselage, more powerful engines and new winglets to achieve performance improvements over the previous model. First flight is scheduled for April 2009, with FAA certification planned for the first half of 2010. Hawker Beechcraft claims to have received orders for several dozen Premier IIs. The Premier I is constructed with high-strength composite, carbon fiber/epoxy honeycomb fuselage. The Premier I and IA can be certified as light aircraft for operation by a single pilot. The powerplants are Williams International FJ44-2A engines. Premier I - basic version, introduced in 2001. Premier IA - new cabin interior and improved systems. Premier II - new engines and wingtips, range increase achieved with no extra fuel.